Sometimes, the Universe works in very mysterious ways in order to catch our attention and direct us down our destined path in life. One of these ways is sending angels to communicate powerful messages that show up as repetitive numbers no matter where we look. These numbers are called Angel numbers, so if you're seeing them, you should really pay attention to what you're doing or thinking at that time because the numbers are there to guide you. Do you want to know the significance of 111 because you keep seeing this number everywhere around you, whether it's on the clock, on license plates, or addresses? Keep reading and you'll find out more about the meaning of 111. When you're seeing 111, the angels are trying to tell you that you're on the right path, so if you continue to do what you're doing in your life right now, you'll soon be rewarded. 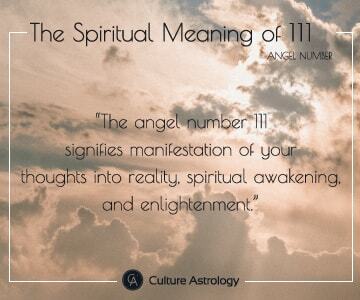 The 111 angel number is considered the most divine of all the numbers. Even though there are multiple 111 angel meanings, the most important thing you need to know about this number is that it is a sign of alignment and a message from the Universe to let you know that things are all aligning very nicely. The number 111 is a very good sign and signifies manifestation of your thoughts into reality, spiritual awakening, and enlightenment. When it starts appearing in your life, the most important message this number carries is the need to pay attention to your thoughts because they will manifest into reality. The angels want to remind you that you need to think positive and remove negative energy from your life. Think only about the things you want to manifest in your life and don't let fear or doubts overwhelm you. Seeing this number everywhere you look is actually a sign to take action and seize every opportunity on your path. You have the help and support of your guardian angels, so, trust that new opportunities are coming and you'll be able to accomplish all your goals. In some cases, the angel number 111 means new beginnings in love. Be aware of your thoughts and think only about the things you want to experience in your love life. Never think about your past disappointments, because in this way you will attract the same things into your life again. Seeing this number sequence is also a sign that if a relationship is not working, it's probably better to end it and make space for new people to come into your life. Numbers also take a significant place in the Bible, so when you're seeing some number sequences repeatedly, if you look into the Bible you can find out what these numbers mean. When it comes to the number 111 meaning in Bible, it's often related to the Trinity: father/son/holy spirit. However, this number is also used as a symbol of the sky and it is mentioned in the Bible a lot of times. For instance, there are 89 chapters in the four Gospels and 22 chapters in the Revelation of John, and if we sum up all these chapters we have 89 + 22 which gives 111. Also, during the crucifixion of Jesus, there were 111 soldiers from Rome. The appearance of this number in your life could also mean that you're going through a spiritual awakening. If you're wondering "why do I keep seeing 111" or “what is the spiritual meaning of 111”, you should know that your guardian angels want to connect more deeply with you and in order to do that, you'll have to become more spiritually conscious. When you focus on your own spiritual growth and self-development, you'll become more open to new experiences and you'll see the world differently. The angels want you to be open to spiritual experiences and be grateful for their guidance and existence in your life. Your gratitude and appreciation will keep your guardian angels present with you all the time because they'll know that they're welcome. Why is the time 1:11 so special? If you're seeing 1:11 every time you look on the clock, the angels are actually trying to get your attention and send you a powerful message that they're here to help you manifest your visions and dreams. They want to remind you that your thoughts can have a huge influence on the outcomes in your life, so in order for you to accomplish your goals and dreams and live the life you want, you have to imagine it in your head first. Free your mind from fear or worry and keep your thoughts positive. Another 111 meaning is that the angels want you to start practicing gratitude every day. They want to remind you that you need to be thankful for everything you have and cherish the people in your life, so you'll be more in tune with your angel guides.